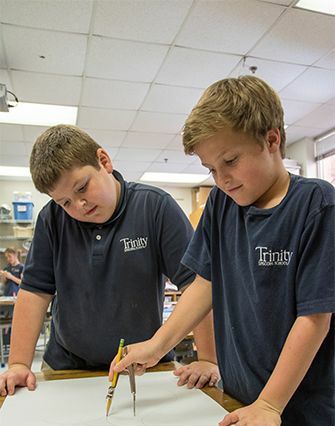 Trinity’s Lower School, encompassing grades One through Four, is filled with children who are highly motivated and excited to become lifelong learners. Trinity’s Lower School provides an ideal setting for each of our young students to build a solid foundation by placing a strong emphasis on the development of the whole child socially, emotionally, and academically. Our Lower School faculty ensures that each child is known and valued. Each student is able to learn and grow in an environment where risk taking is encouraged and mistakes are viewed as opportunities for growth. In Lower School we strive to ensure that each child is excited to come to school each day and eager to see the new learning adventures that await them! Trinity children are taught to value the learning process. They are provided with academic choice in their learning throughout the day. Our Lower School children are are happily engaged as they are busy selecting writing topics based on individual interests, discovering new ways to tackle math concepts, or creating a plan for how they will present their knowledge on a favorite science or social studies theme. Student choice in learning provides our students with the opportunity to think deeply, articulate their thinking, and become expert problem solvers. Our dedicated faculty provide children with a warm, nurturing environment. The Lower School classroom focuses on building skills in cooperation, assertiveness, responsibility, empathy, and self control. We support our children daily as they become confident, resilient, and increasingly independent throughout their Lower School years. As our students enter First Grade, increased emphasis is placed on academic skills in language arts, math, social studies, and science. First Graders begin their year by learning how to build good reading habits and begin to find joy in reading a variety of children’s literature each day. They also quickly blossom into beginning authors as they have daily opportunities to express themselves in writing by working in small groups with teachers and with their peer writing partners. Thematic study in First Grade includes a study of New Orleans neighborhoods and architecture, a study of Louisiana, the rainforest, China, and Egypt. First Graders also have many opportunities to perform for the community throughout the year as they work hard to build skills to become fluent communicators. As children enter Second Grade they are ready to expand their knowledge base and are blossoming socially as well. Second Graders at Trinity gain confidence as they continue to excel in reading, writing, math, science, and social studies. The Second Grade hallways are filled with an energy that instantly brings smiles to the faces of all who visit. Moving to Third Grade at Trinity brings even greater independence. Our Third Graders broaden their knowledge of math and begin to deepen the connections they make in their classroom learning to life outside of school. Fourth Graders continue to thrive in small reading group classes in which they are able to dig deep into their learning with novel studies that help to expand their understanding of the world around them. Daily small math groups allow each child’s learning needs to be met at his or her individual level, maximizing the potential for each child to excel. As Fourth Graders, Trinity students begin to learn to manage their time wisely and start to take true ownership of their learning. These upper elementary students are often able to present their ever expanding knowledge to one another through use of technology, group work, and creative presentations. Teachers strategically assemble student groups based on individual learning needs, interests, and learning styles. Children in Lower School also have the opportunity to participate in elective classes often throughout the school year. These elective classes may include robotics, specialized art and music experiences, cooking classes, health and fitness classes, and many other exciting classes. These elective classes are student driven, and children work within a multi aged setting during electives, allowing them to expand their friendships and learn how to work collaboratively with children of different ages. Every step of the Lower School day is focused on meeting the social, emotional, and academic needs of each individual child. The curriculum is broadened with many special subjects including French, art, music, daily physical education, library, religious studies, science lab, and Skills for Living. Trinity children are talented in many ways. Whether it’s performing in a school play, creating original pottery in art class, or showcasing their physical talents on the sports field; our students show us daily that they are eager to give their best effort in all of their endeavours. In Lower School, teachers use the same Responsive Classroom approach practiced in Preschool. Clear expectations are stated for the students, and a community of belonging, significance, and fun is created in each Lower School classroom. Each child is well known and valued by the classroom community. Every day in Lower School begins with Chapel and then is followed by classroom Morning Meetings where each child is greeted, has an opportunity to share, participate in a group activity, and hear the news and announcements for the day. We provide a learning environment where children feel happy, safe, and loved. Our students cannot wait to come to school each day! Beginning our days in Chapel is a wonderful experience where the daily message becomes an important part of our lives as we strive to be a community of upstanders who are prepared to make a positive difference in the world. In Chapel and throughout each school day we do our best to live the words of our school prayer, “gentle, generous, truthful, kind, and brave.” Our school community is focused on living a life based on a foundation of faith and moral responsibility. We are committed to educating the whole child and celebrating individual differences. Throughout the Lower School years children gain personal responsibility, empathy, and learn to respect multiple viewpoints. We pride ourselves on stimulating both minds and hearts. We hope you will visit Trinity and see for yourself the incredible teaching and learning that takes place in our community.